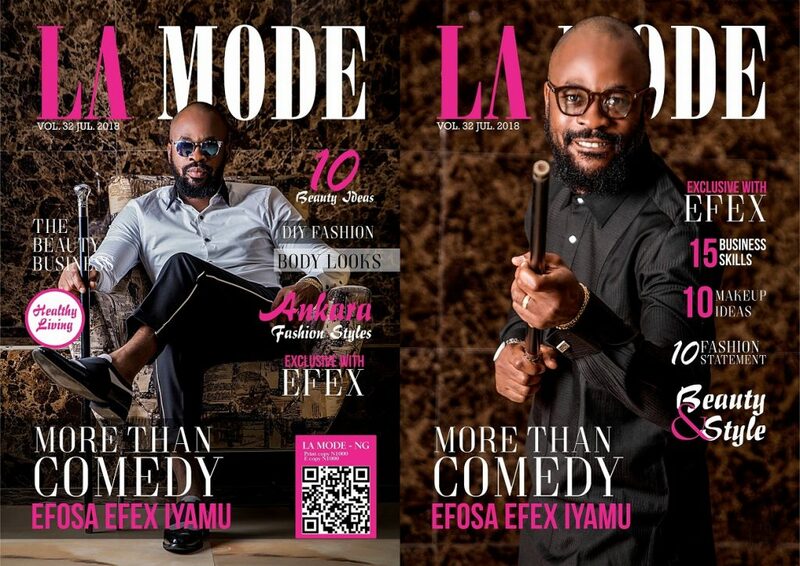 July Cover Alert: ”More Than Comedy” Featuring Efosa Efex Iyamu! Efex: I was born funny, I love what I do and I do what I love. It is just an added advantage that I get paid for my love. I love to see people happy and smile. I have started my professional job for about 18 years now and while I was in school, I used to mimicking of some popular acts then and it made me very popular and i knew I had gotten that niche to progress in this…even while I talk to people and I am serious, they just laugh some times. La Mode: What influences your comedies and performances? Efex: I am as spontaneous as possible; I look around me and do my thing. I also read a lot (I have a book to my name with the title—MORE THAN COMEDY) so it’s always nice when I have seen the news about happenings both in the state or country or even the world and create things that will make people laugh…I am a professional MC / comedian and so when I am anchoring events ,it is nice to just throw in some one liners and make the event nice and enjoyable…and this country ,there are a lot to talk about to make people laugh so I must have something to say that the crowd can relate to. La Mode: Your favourite hangout spot? 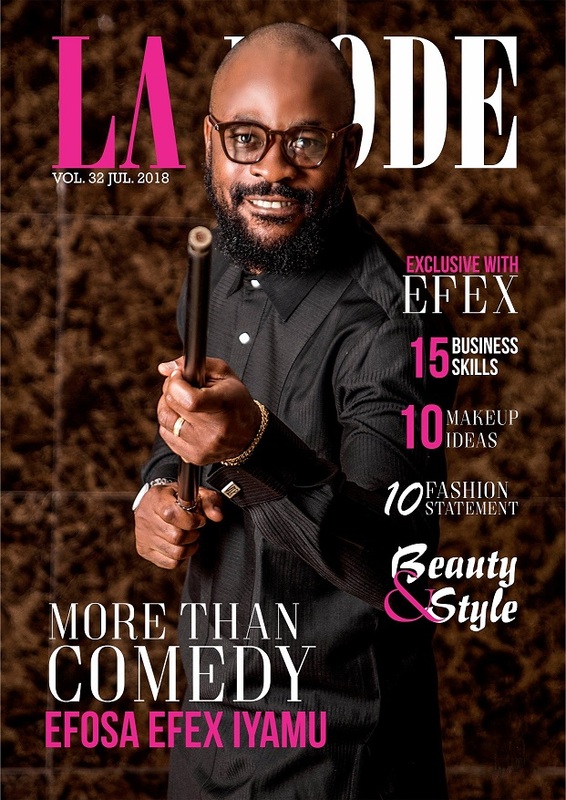 Efex: : In Benin (aso rock cold room in Benin club)…in Lagos it is either cocoon or brass and copper….in London I like to always chill with “mama charlie” (I am related to the queen)….in the US, I love Tony’s bar and lounge in ATL…..
La Mode: What happens if your audience don’t laugh? 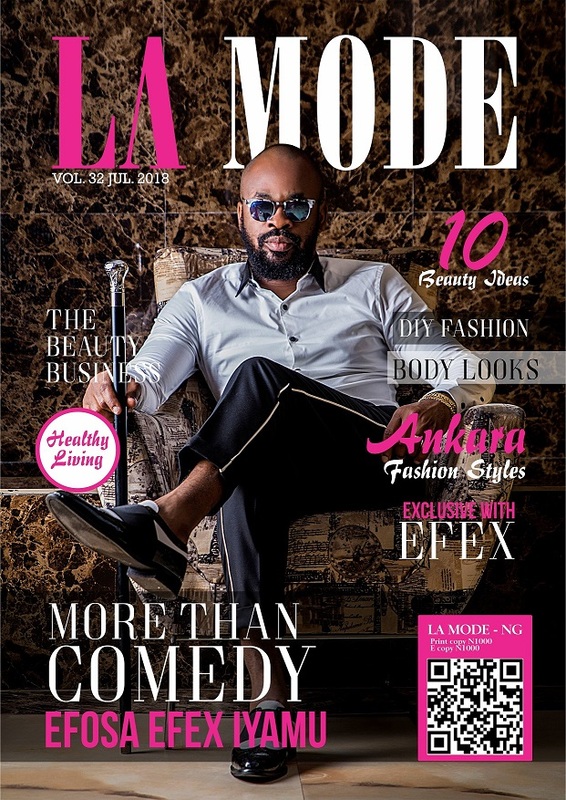 La Mode: If it was not comedy? La Mode: What makes you outstanding in your field? Efex: Well, I think every day of my life is greatness…I have met almost everyone and had some good relationships with people both old and young, rich and the not so rich….but it doesn’t change my attitude….I have been opportune to get political appointments from working with the MIC, and that helped me build even more relationships and learn from both my principal (comrade Adam’s Oshiomole) and a lot of my other colleagues…everyday is both a lesson and a blessing so I am still getting greater by the day…..
La Mode: What makes you happy knowing that your job is to make people happy? Efex: that is the idea, I love to make people happy….I usually say that if my success can’t make someone else successful then in a failure….I am happy when I see people comfortable and happy…I go out sometimes and people come ask some questions about what bothers them and then I can provide some solutions, it makes me really happy..
Efex: I went to perform at a big comedy concert and when I got back to the hotel that night was hungry and ordered sandwich and a drink…when i was done the next morning, I had a bad Tommy ache because I was Infected with food poisoning…unfortunately I had another event that day to anchor, I was throwing up and stooling for hours until I passed out and was rushed to the hospital….it was a bad day that I don’t even want to think of again. La Mode: Tell us about one good day in your comedy career. Congratulations to Tinsel Star Tomi Odunsi on her engagement!